Frontline Plus is a quick, convenient, and effective way to prevent fleas, ticks, chewing lice, and sarcoptic mites from making your dog a walking resort. When applied monthly, Frontline Plus completely eradicates every stage in the life cycle of fleas, ticks, and chewing lice. Spreading from just one point of application, this medication rapidly covers your dog's entire body with protection against these creepy crawlies. Effectively protecting against these parasites for 30 days, Frontline Plus for Dogs is safe for use on dogs 8 weeks and older, and is completely waterproof. Dogs taking Frontline Plus may experience a slight irritation at the point of application. If the irritation persists, contact your vet immediately. 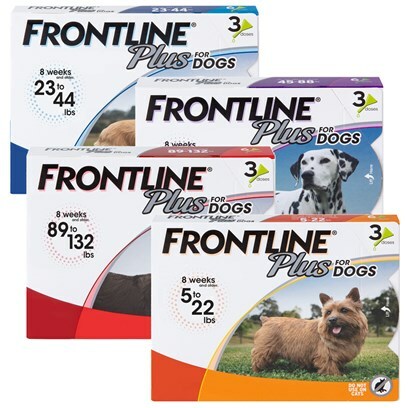 Frontline plus contains two active ingredients - Fipronil and S-methoprene. Frontline Plus should be administered once a month. To apply the medication, open the pouch by holding it upright and snapping the tip, holding it away from your face and body. Part the hair between your dog’s shoulder blades, placing the tip of the applicator on the exposed skin and squeezing out the entire contents of the tube. Do not simply apply to the hair.